Emotions are the focus of intense debate both in contemporary philosophy and psychology and increasingly also in the history of ideas. 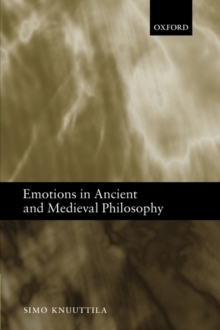 Simo Knuuttila presents a comprehensive survey of philosophical theories of emotion from Plato to Renaissance times, combining rigorous philosophical analysis with careful historical reconstruction. The first part of the book covers the conceptions of Plato and Aristotle and later ancient views from Stoicism to Neoplatonism and, in addition, their reception and transformation by early Christian thinkers from Clement and Origen to Augustine and Cassian. Knuuttila then proceeds to a discussion of ancient themes in medieval thought, and of new medieval conceptions, codified in the so-called faculty psychology from Avicenna to Aquinas, in thirteenth century taxonomies, and in the voluntaristapproach of Duns Scotus, William Ockham, and their followers. Philosophers, classicists, historians of philosophy, historians of psychology, and anyone interested in emotion will find much to stimulate them in this fascinating book.